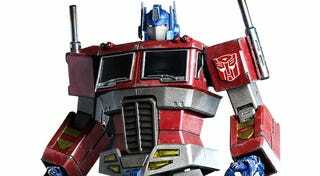 Hot Toys are releasing an Optimus Prime figure. I know you can't see it, but my wallet is suddenly flapping around like a bat, and I'm having a devil of a time trying to catch it. The 30cm figure, based on Prime's G1 design, is actually Starscream-inspired, and for whatever reason - I can't remember this ever happening - has the Autobot leader rocking Starscream's wings and arm cannons. It looks pretty stupid, so thankfully you can remove them all and just have Prime standing there in his articulated, highly-detailed glory. I've got an old masterpiece Prime, which I thought was going to be the ultimate Optimus figure for the rest of time (and in some ways might still be, since this one doesn't transform), but I guess his reign had to come to an end sooner or later. Be warned: he's selling for $350.